Life’s been its own brand of crazy the last couple months. So I’m only now–a MONTH after the fact–getting around to sharing these cool purchases! 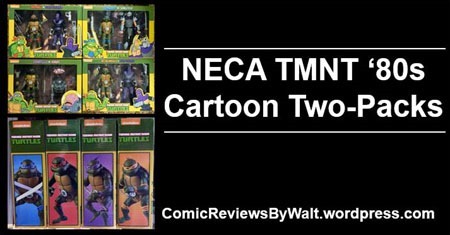 I’ve been AWARE OF the NECA brand since 2010 or 2011…whenever they did the Mirage Comics-style turtles, before the 2012 line for the Nickelodeon 2012 show was out from Playmates. 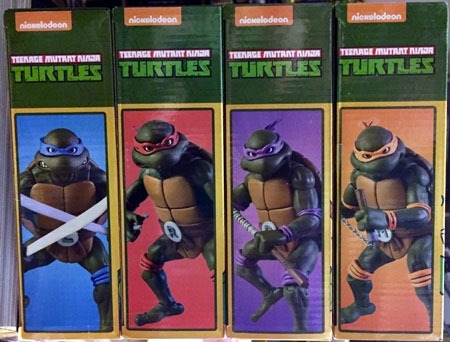 Having recently (finally) bought the Raphael and then Leo & Mikey 1/4-scale figures, these 2-packs from Target were not a terrible stretch…though it was a LOT to spend in such a short time-frame. But they served as a sort of "retail therapy" or such. I’m not the greatest fan of the 1980s cartoon. 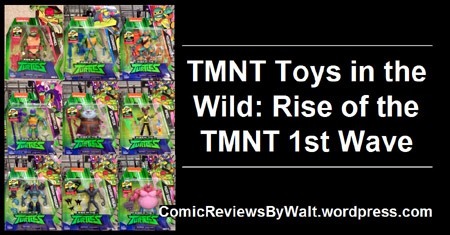 For a time, I actually held a fair bit "against" it, though as the IDW comics have continued and have incorporated elements, stuff has been somewhat "redeemed" and I’ve come to appreciate its place in history–in general and of the TMNT property in general. 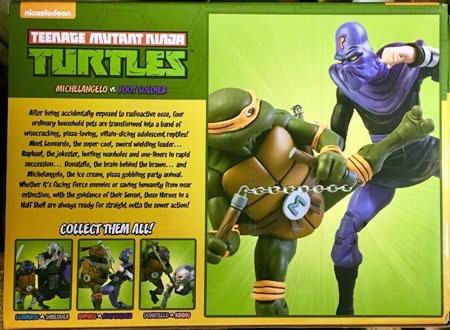 And these 2-packs made for a decent "set" of figures…that’s certainly one thing about the TMNT stuff–it’s totally geared for sets of 4 with the main characters! 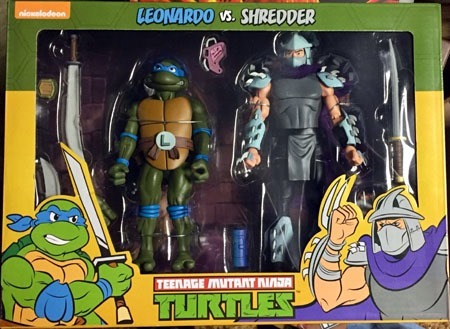 Leonardo and Shredder make for a good pairing here. 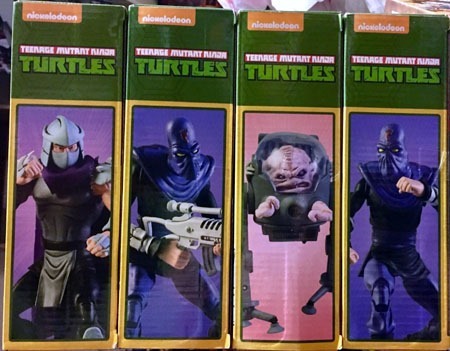 All the 2-packs are one turtle and one villain. So of course, matching the "leaders" up works quite well on a number of levels! While the front of the boxes are showing off the figures themselves, the backs show a staged photo, a short description, as well as the other 3 boxes available for this "wave" of figures! 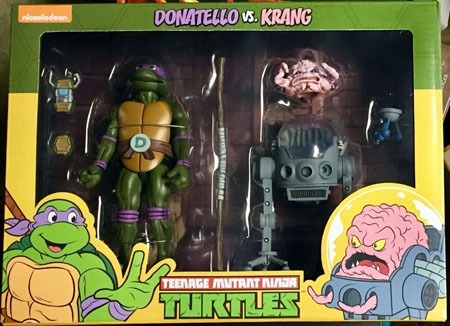 Donatello and Krang are the "brains" of their respective groups…Krang pretty literally so. That makes these a good matchup as well. The walker contraption Krang rides in–from the earliest episodes of the ’80s cartoon–is roughly the same height as the classic Playmates figure…though Krang himself is a lot smaller here and more proportionate. 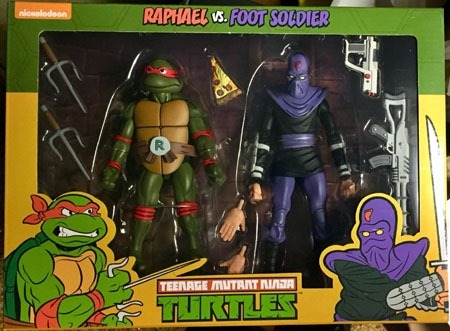 Though Raphael has come to be my favorite turtle as an adult, his 2-pack has him and "just" a Foot ninja. I’ve never been overly keen on this version of the Foot–mindless robots just seem like they shouldn’t be a threat whatsoever. And generally they were not MUCH of one, just a delaying tactic. Still, the poseability on the NECA figure(s) makes this far, FAR superior to the classic Playmates iteration! Cliché as it is, there IS the classic line from Raph’s first encounter with the Foot bots. "Klang?!? Did you say–‘Klang’?" 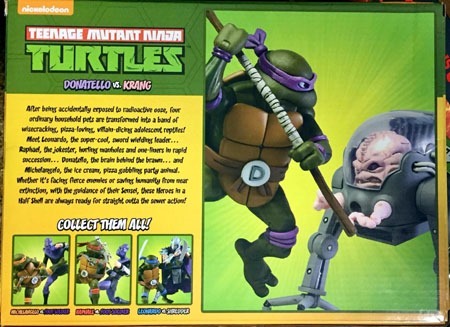 Michelangelo also comes with a Foot bot, that seems basically the same as the one with Raph. Though it would seem a someone generic thing to have half the packs come with these…it also actually, truly makes sense as the Foot bots ARE generic and to just have one is to defeat the point of having generic minions. And as these are a much better quality, I’m glad TO have two, although I’d have also been rather happy if these came in their own 2-pack, so that their slots could be filled with other characters! 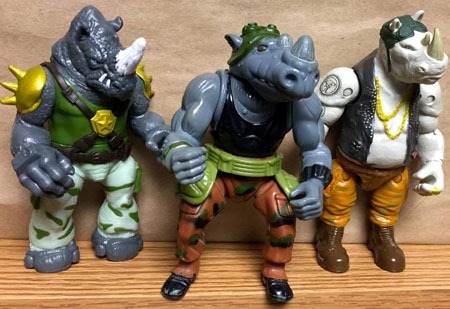 Of course, I believe I saw stuff coming out of the one toy convention that NECA has upcoming plans for Bebop and Rocksteady. And if they come in 2-packs like these…I’d be grateful to get the pair as their own pack. 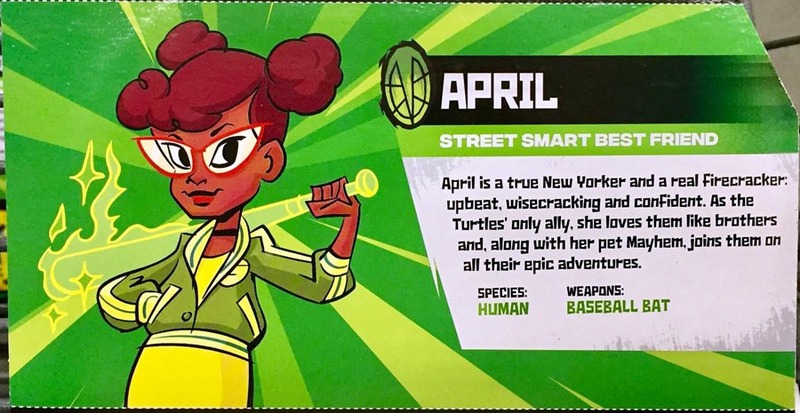 But if there’s to be more hero vs villain foolery to further induce buying of multiple packs…I’d take April and Splinter with them, and/or Casey Jones! 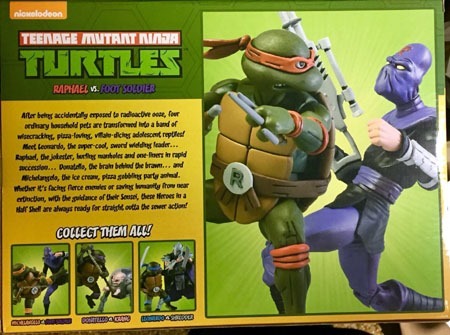 Here we have the back of the pack with Mikey gut-kicking his Foot bot. 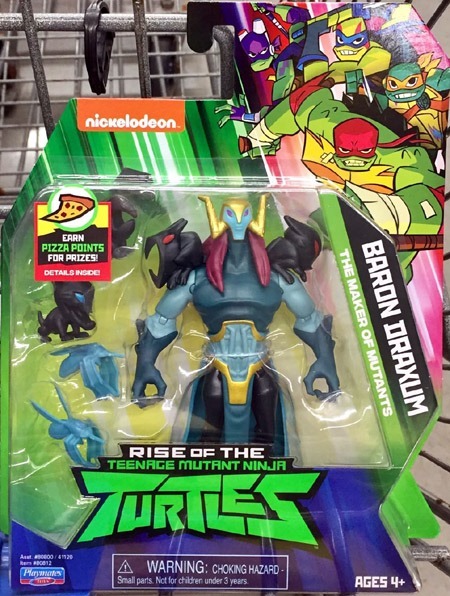 …while the other side shows the villain that turtle’s paired with! The packs are definitely quite attractive as-is. 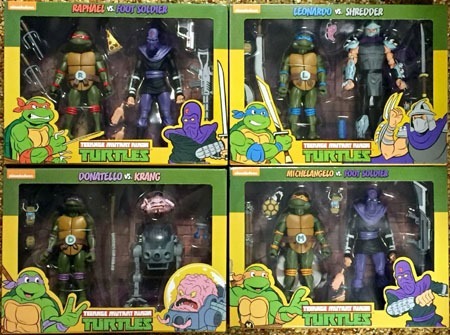 But these being TMNT, I "couldn’t" just leave them in their boxes. So I did get them out. However, the photos of the unboxed figures will have to wait for another post! 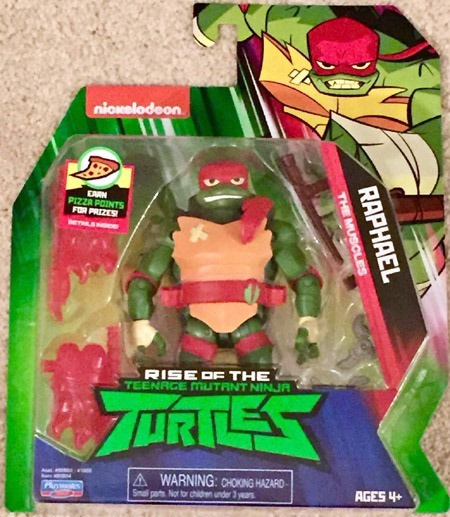 I already posted about the Raphael figure I bought over the weekend, with the new Rise of the TMNT toy line starting to make its appearance. I came across a display of the entire first wave of basic figures, and got photos of them "in the wild" (actually at a Walmart). 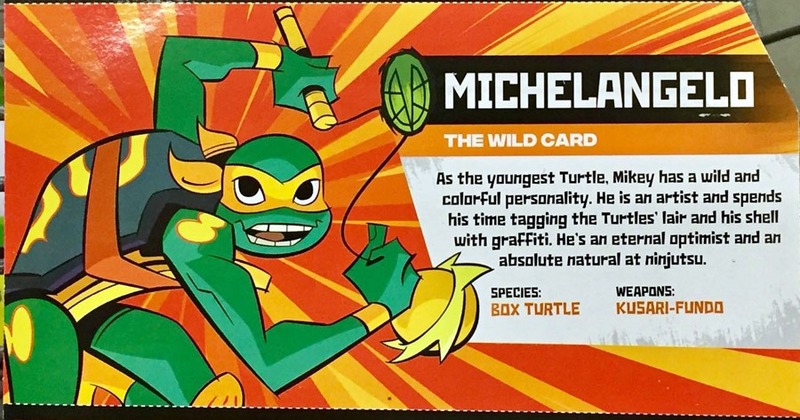 Including the not-in-the-wild Raphael, here are my photos of the figures "on the card" as well as their "profile" from the back of the card, a la the old "clip-and-collect" profiles from the ’80s line. 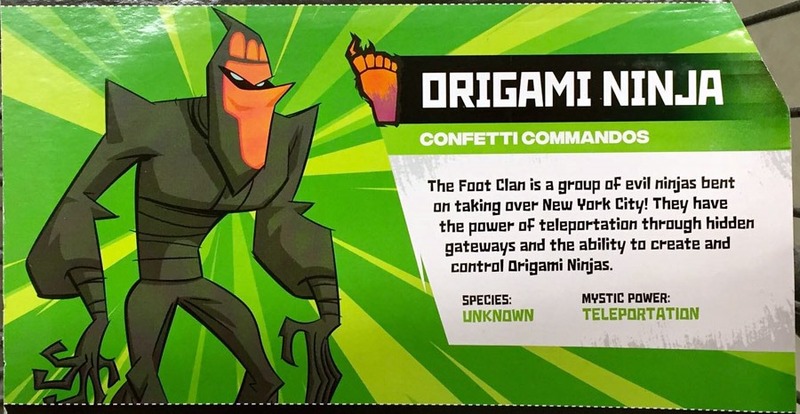 Until seeing the figures for myself, I hadn’t realized the Origami Ninja had a foot slapped on its face…which does somewhat "qualify" it as a Foot Ninja…so against prior expectations, I may (eventually, perhaps) try to get several. 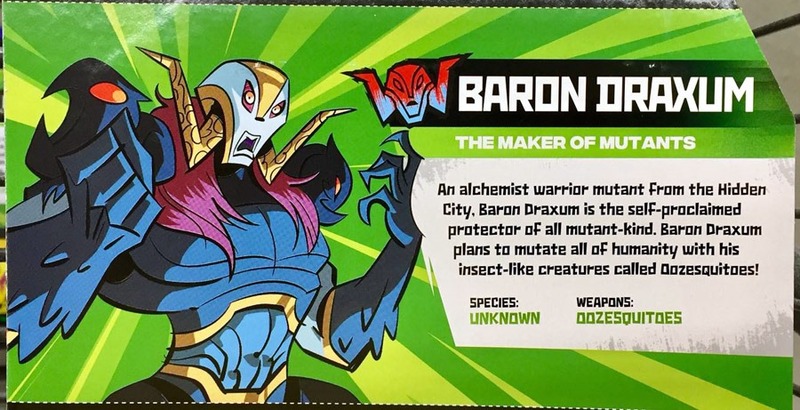 And Baron Draxum seems rather obviously a stand-in for Shredder, so there’s a good chance I may (again, eventually, perhaps) try to get one. 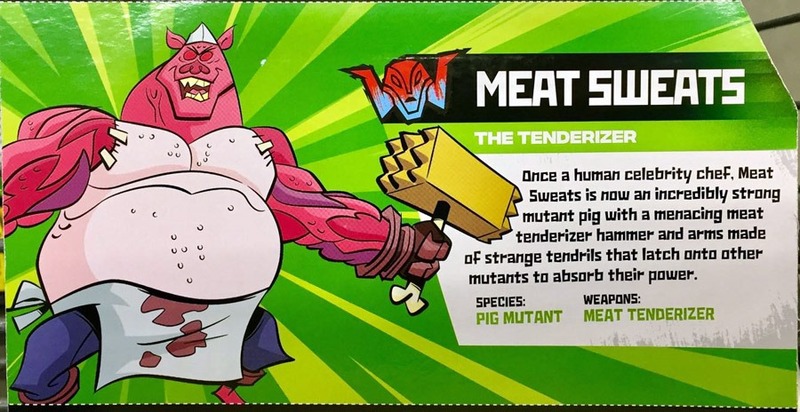 I’d figured Meat Sweats would be "worth it" for bulk alone…but I think I’ve pretty much decided that if I want a large pig muant…I’d rather go with a 30+ year old classic in Bebop. Time will definitely tell. And I suppose I’ll be curious as to what other figures will make their ways out for this line. I remember the 2012 line rolling out by early August 2012, and 3-4 more figures by Christmas. Given we’re at early October for these, I think I’d be sorta surprised to see a second wave in 2018, though not too surprised if another makes it out in early 2019. 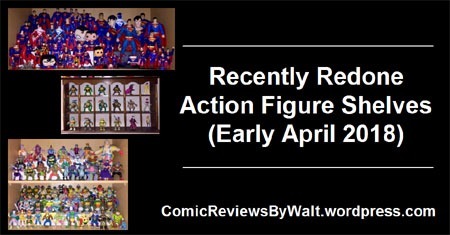 To borrow a phrasing style…I’d buy the heck outta those, at under-$10/figure! But that wishlist and topic is surely a topic for some other post. 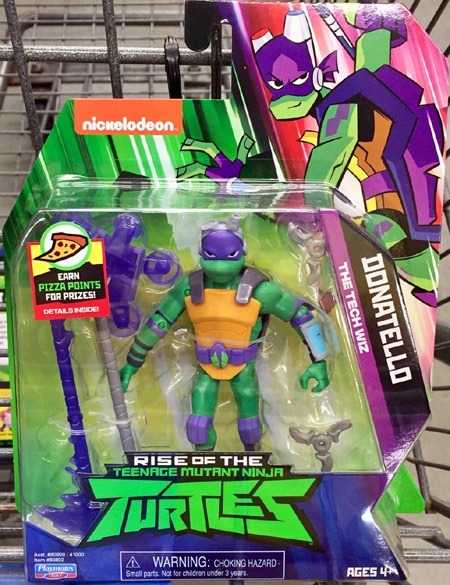 For the first time in over six years…there’s a new "main" line of TMNT toys out. 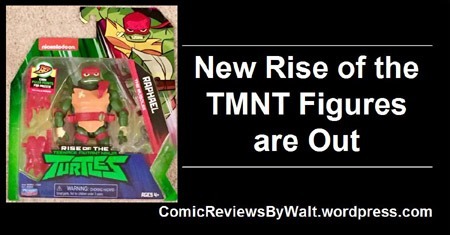 BEING that it is the Ninja Turtles–my core "exception" on stuff in comics–that bleeds a bit into the toys. 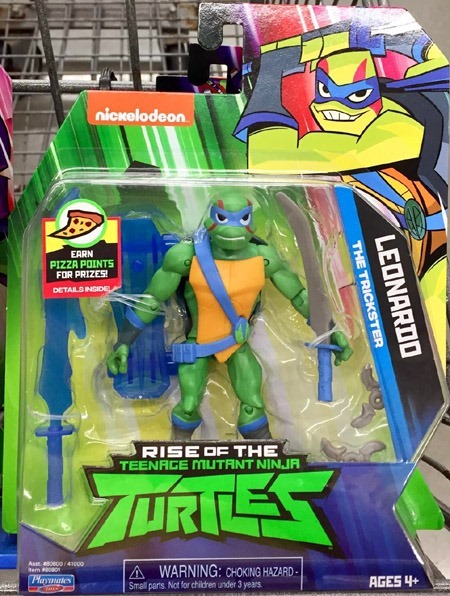 I’m not a fan of Rise of the TMNT. I was NEVER the best at "keeping up" with the 2012 animated series–nor ANY animated series, PERIOD, in the last 15 years or so, no matter how much I love the series itself. But I’ve always HATED the "optics" of Rise–namely, that the 2012 series was flat-out cancelled TO MAKE WAY FOR this new series. Whether that was actually the case or not, I don’t know–but it’s certainly how I FEEL on the thing. I watched the first episode some time back now, it was "free"–and while it wasn’t as "bad" as I’d expected (perhaps my view has softened since I watched it), I did not like it, and I really do not like a number of elements from it, particularly the character designs. 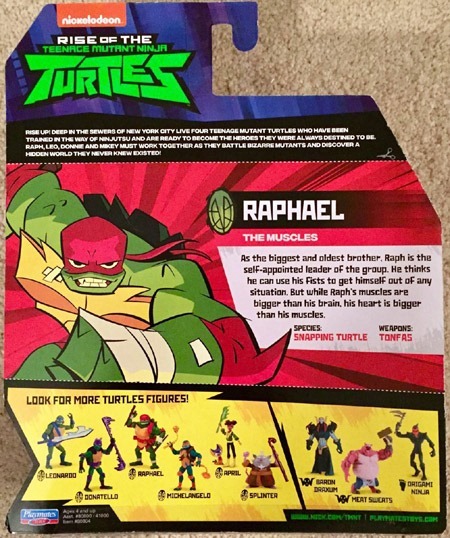 But somewhere along the way, I got it into my head that when the new toys came out, I’d probably "at least" try getting Raphael. 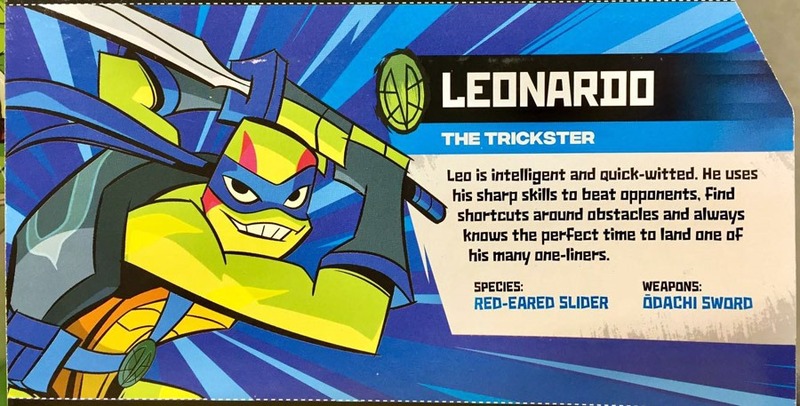 "Traditionally" Leonardo was always my favorite of the turtles, and the one I’d claim as a kid and growing up. 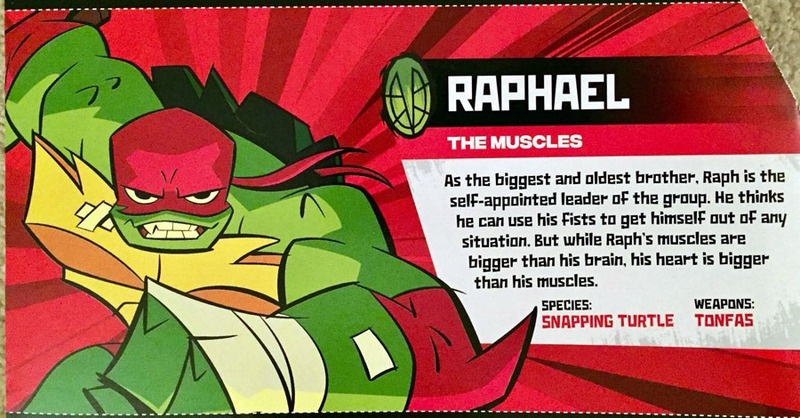 But over the last 10-15 years, I’ve found a newer preference for Raphael. So I did indeed go ahead and get Raphael, finding the figure available this weekend at a local-ish Walmart. 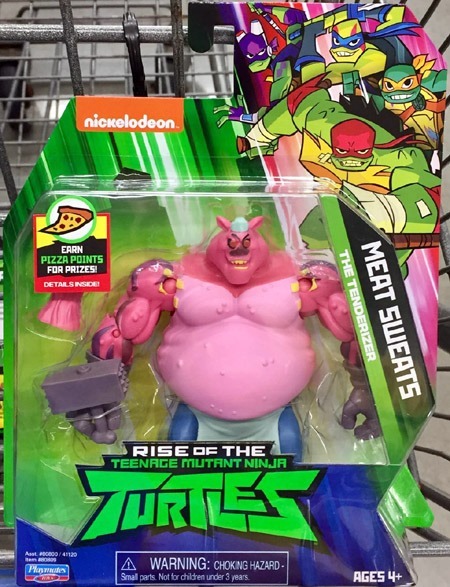 And on the surface, the figure itself doesn’t look totally horrid or such…this one, at least, actually more or less looks like a decent TMNT figure, albeit the character does not come with the sais that have been associated with this character for 34 years. But the "new/different weapons" thing is a whole other matter I’m not getting much into right now. The back of the figure is more or less what I would expect, if slightly more basic-looking. The bulk of the back is the "profile" of the character. It makes sense of course, for that to dominate…it just seems almost "too" dominant to me. With a new series, new toy line, I’d somewhat expect the part showing the figures available in this first wave to be a bit bigger, to better emphasize and show off THAT there are other figures! Even so, I’m not enamored with most of these other figures as shown. 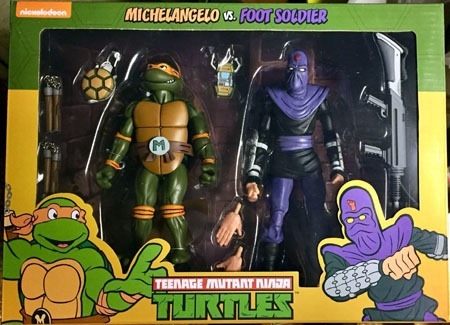 Leonardo is dominated by the giant sword and seems scrawny; as does Donatello with a more proportionate staff weapon; and Michelangelo also seems rather scrawny for a Ninja Turtle. 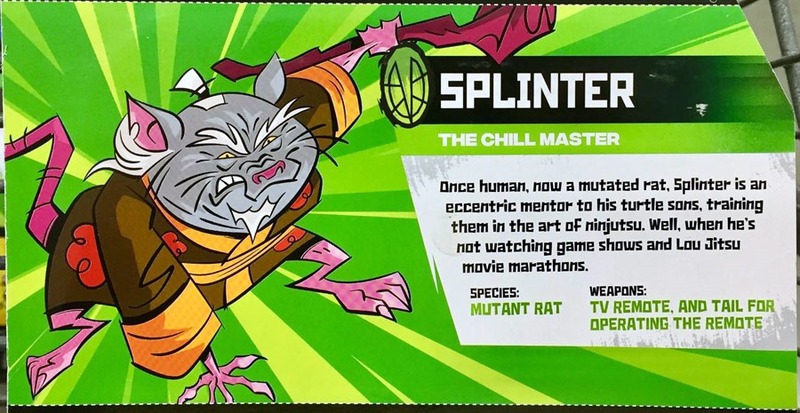 I’ll be curious about Splinter as he looks rather small, but could be interesting. 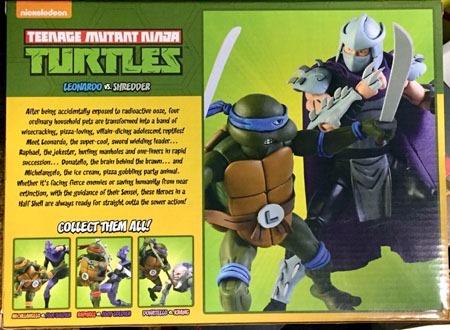 This is the first "main" TMNT toy line that I’m aware of that has NOT included a Shredder in its premiere wave. On one hand, that’s a bit refreshing; on the other–and in context of these toys–I find it rather lame. The butcher character might be interesting for size…it looks like a nice, bulky character that’ll at least be worth its price for that bulk; where the ninja doesn’t look like it’ll even stand on its own. 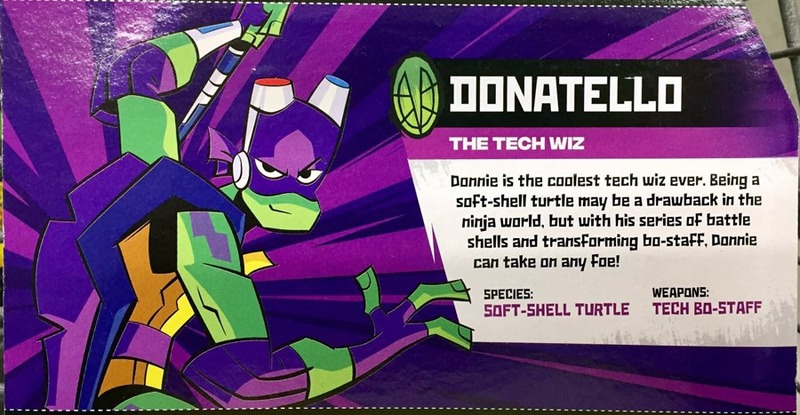 As a TMNT guy, as a collector…not having a Shredder and not having any Foot ninjas does this line a real disservice. I’m not invested in any of the villains…and with neither Shredder nor Foot, there’s not even the notion of having a new version to "match up with" the previous versions. 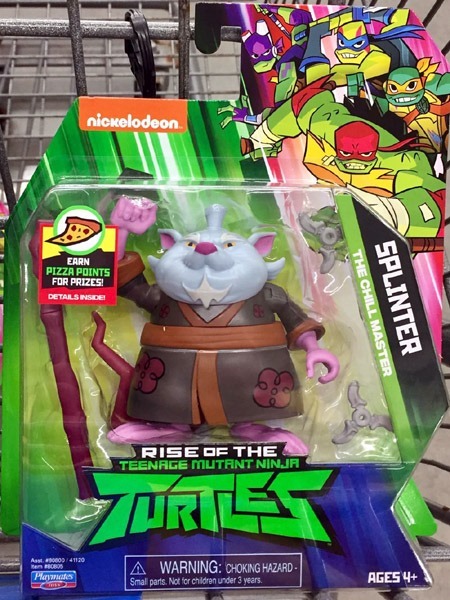 I’m reluctant on the other turtles, but have NOT ruled out the idea with myself that I’ll get the other turtles and Splinter to at least have the "set." I appreciate the idea of having new characters and NOT merely regurgitating the past. That said…I’m NOT invested in the new show. I’m not invested in the particular new characters. 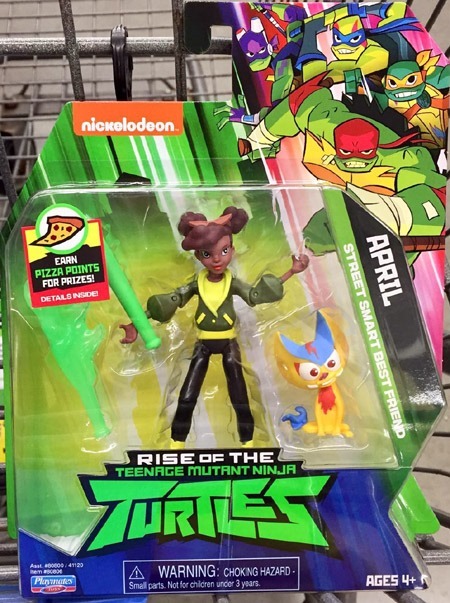 I may get the other three turtles and Splinter–at least eventually–but I don’t really see getting much into this iteration of the toy line. I could wind up eating those words, though. This comes a couple weeks later than intended, but that’s just how things are! At a Walmart, I’d come across another bin of Hot Wheels cars. Much as with several previous Marvel waves, I was able to find the entire numbered series, and given the small price point each (all 8 for less than the price of two Marvel comics), I went ahead and bought them. 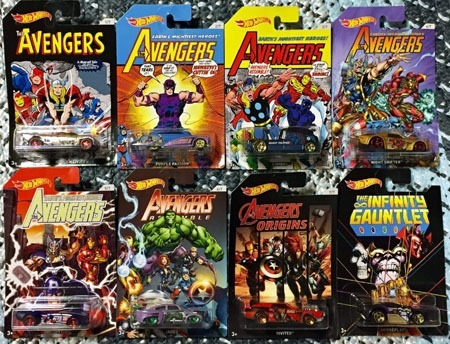 These were numbered 1 through 7 of 7…and then the Infinity Gauntlet car was unnumbered. Of course, had I only bought one, I definitely would have gone with that. Only two, and I’d’ve gone with that and #4; three I’d have gone with that and #s 4 & 5. As usual, these are kinda neat, spotlighting the Avengers through history. As I was primarily into them for Heroes Reborn and Heroes Return, #s 4 & 5 are my favorite here because of the cards! And with this as a bit of a filler post–new content weekdays–here’s an update to the toy shelves/displays! On top is the bulk of the Mighty Morphin’ Power Rangers collection. Then the TMNT (’80s/’90s) villains; then TMNT (’80s/’90s) "good guys" (non-turtles). On the other side, the Power Rangers extend on over at the top, joining an AT-AT and Fin Fang Foom. Below that’s the Superman shelf. And finally, the newest shelf, with the Doomsdays and then mostly ’90s-ish miscellaneous figures. I’d intended to do a similar display for my Marvel Legends, but they won’t fit, doing the three-tier, so I’m going to have to figure out something else! Along with recently redoing the setup of my comic space with new bookcases and such (which I will "eventually" be showing off here), I’ve been working on redoing some action figure shelves. I also have this old wall-display shelf I "rescued" from the attic of my parents’ old house. 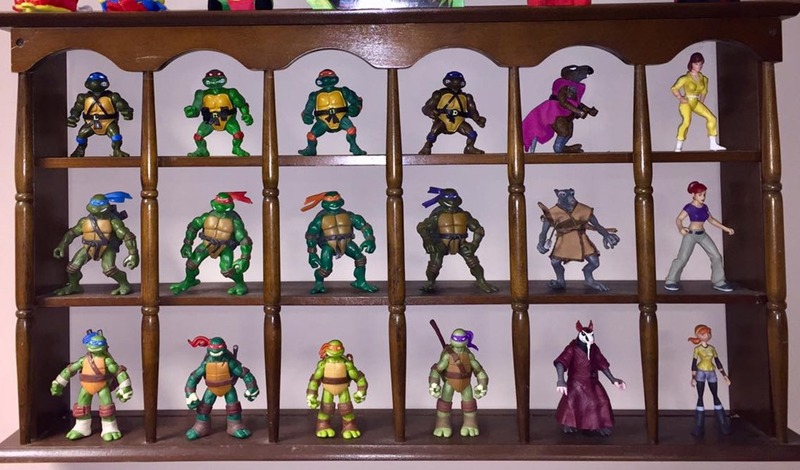 It’s perfectly-slotted to display the three "generations" of TMNT so far, along with Splinter and April. Whether this display remains somewhat permanently or not remains to be seen…especially with a new "4th generation" line due out soon (for better or worse). Then there’s my Superman shelf. Previously, I’d had most of these crammed onto one shelf on the same level and couldn’t even see many of them. 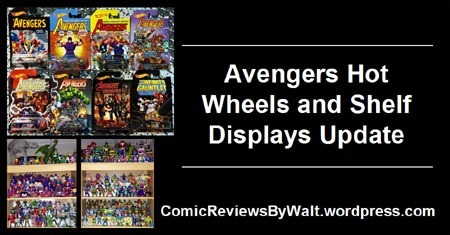 Redoing the display, I’ve been able to incorporate a tiered system that allows for better overall display and visibility of the various figures and such–from the 12" figures to DC Direct to Multiverse to regular size to the various miniatures and such…as well as a statue and even a Heroclix figure. 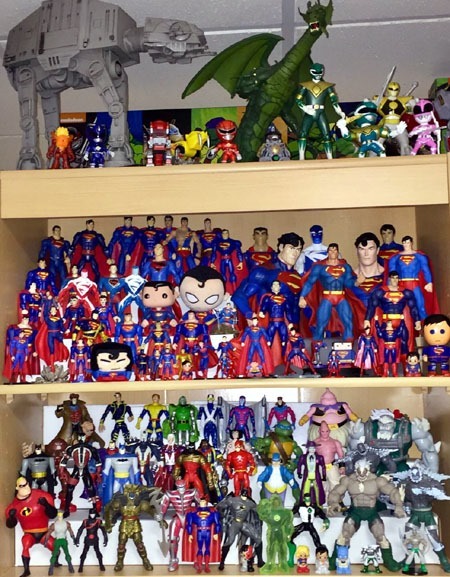 …And these are not even all of my Supermen! But I barely got these to all fit into one shelving slot, and with other figures that I will eventually have displayed and such, it won’t hurt to still have Superman mixed in with those as well! I have several other "shelving slots" to fill, but have to get more supplies yet for my "tiered system" so my efforts were put on hold for a bit. Given events going on in my personal life, that’s not a bad thing, and it’s certainly not a rush to get done! I’ve long been a sucker for build-a-figure toys. Collect multiple figures, get pieces for a big/other figure, voila! Bonus figure in addition to the individual figures. Even longer than that, though, I’ve been a sucker for the likes of Mighty Morphin’ Power Rangers and their Megazord…the combining of the Pterodactyl, Triceratops, Mastadon, Saber-Toothed Tiger, and Tyrannosaurus into the larger humanoid robotic machine (with a power sword!). Alas, the Power Rangers license is screwy (to me) and their Legacy line is ridiculously expensive, especially for buying all in one go, and for the actual size…to say nothing of my ever-so-favorite subject in comics, movies, and toys…VARIANTS. (I am NOT interested in Black-and-White variants of the zords…I want the fully-colorized ones that look like the show. 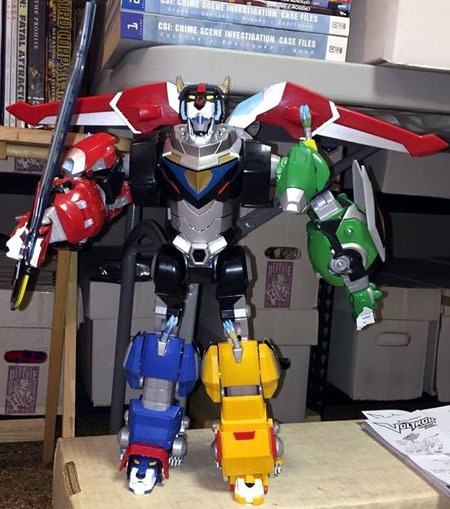 So when I started noticing Voltron toys popping up, they caught my attention. I knew enough to know that they’ve got five lions and Voltron. The combining of the Green Lion, Yellow Lion, Red Lion, Blue Lion, and Black Lion into the…larger…humanoid..robotic machine (with a power sword!). So I started snagging these. Way too expensive to justify getting all at once, but over a period of time, didn’t "feel" the cost as much. And then some more time before getting them out of their packaging. I got them out of the packaging all in one sitting…barely. Compared to when I was a kid, modern toys’ packaging is ridiculous! All sorts of zip-ties and twist ties and bindings and lock-in plastic and tape and fasteners…I wound up with scissors, a pocket knife, and wire cutters to get these things apart from their packaging and into the open! As individuals, the lions are pretty cool. I like the different sizes, and the looks in general, and definitely dig the sound effects from the Black Lion. For detailed reviews of the individual Lions, please check out the following, over at Figure Fan Zero! 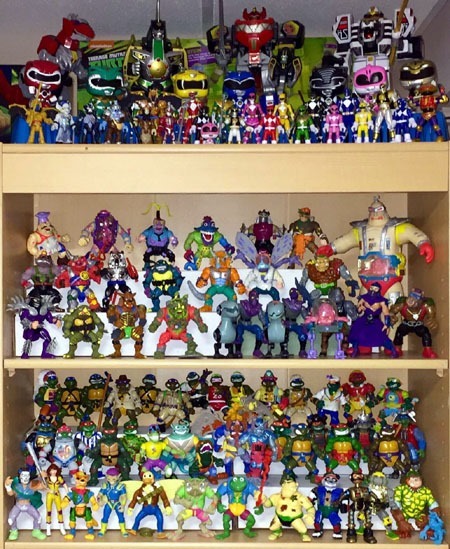 (and check out his blog in general…loads of great posts about all sorts of toys and such…very much a great read for the "adult collector" (as opposed to "for kids"). Those posts do a far superior job to anything I could do on these guys…and helped ensure my purchases on these after having thought idly about ’em before that! I had a heckuva time getting thet lions configured to join together, and eventually had to resort to YouTube videos to kinda figure it out…I’m not 100% that I’ve got them assembled correctly, but they look good enough to me! 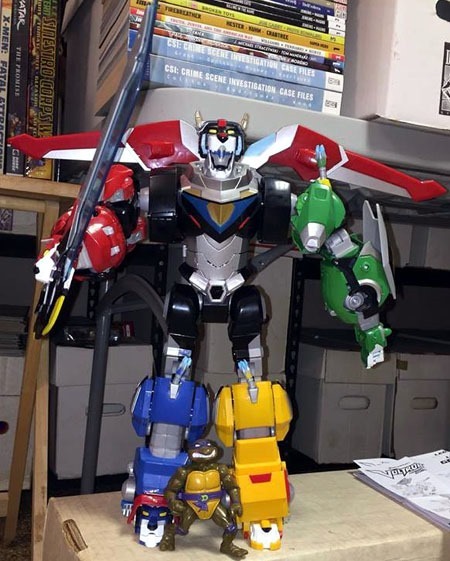 This massive Legendary Voltron stands supposedly about 16" tall…certainly taller than any proper shelves that I could put it on, so it’s with a talking Galactus that I have on top of a rack of comic boxes, and practically touches the ceiling up there! Here, he’s standing on a longbox that’s on the floor, and reaches a table above. I was quite amused at the sound effects generated as I cycled through the Back Lion’s "phrases," and my amusement increased to being highly impressed when I connected the Blue Lion and it acknowledged that the Blue Lion had just been connected, and told me the others were needed. As each connected, it was (correctly!) acknowledged! Now, saying "16 inches" may not really mean much. 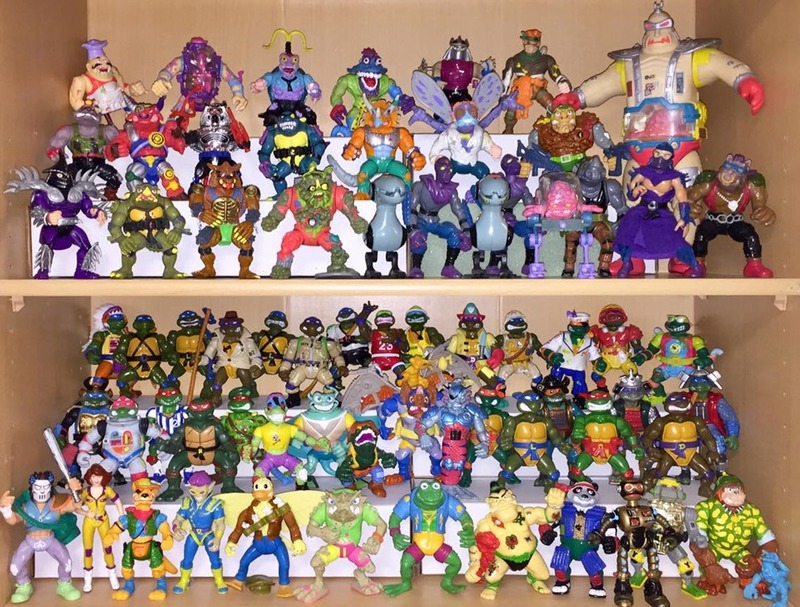 So, here’s Legendary Voltron with a regular-sized Teenage Mutant Ninja Turtles Storage-Shell Donatello just for scale. 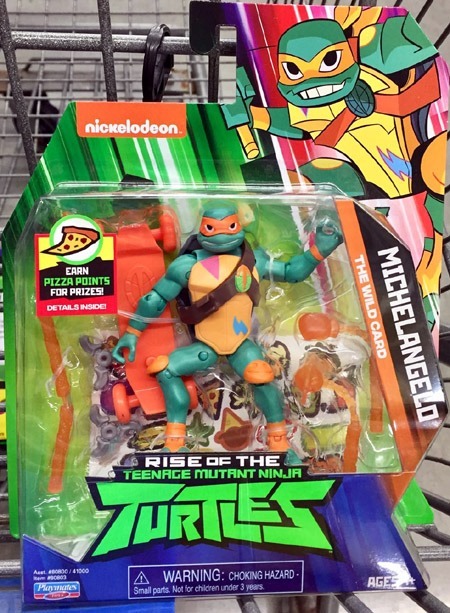 Regular size standard TMNT action figure…huge Legendary Voltron. Also an appropriate comparison, as both come from the same toy company! Part of me can’t believe I bought all these…but past that, I’m quite impressed with this, and while I’m keeping Voltron assembled in this configuration, it’s awesome to know that I could disassemble it back into the five Lions, that are all individualized and poseable themselves, not just pieces of some "real" figure, but real actual figures themselves! And there’s those little "speeders" that came with the lions, each itself supposedly a large vehicle, in scale to the humans…showing the sheer scale of these Lions. 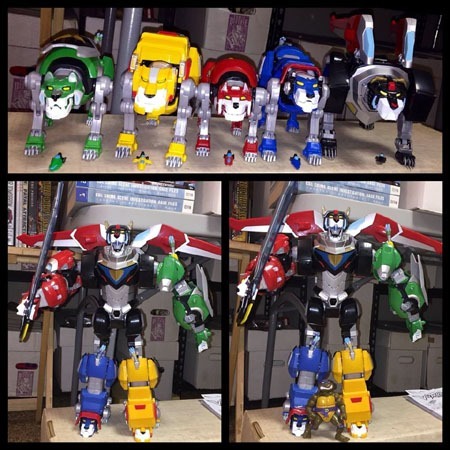 There’s a storage compartment in each Lion for the speeders, so though they’re not seen in the assembled Voltron…they’re tucked inside each Lion! 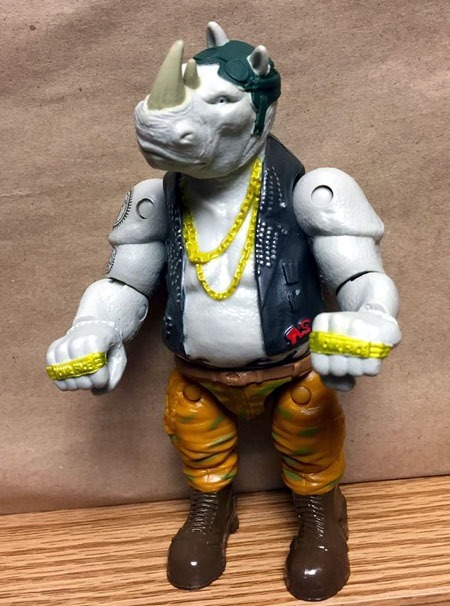 Last year, I showed off all 3 versions of Bebop in action figure format. Now it’s time to show off Rocksteady the same way! Here’s the original figure, from the 1980s line. 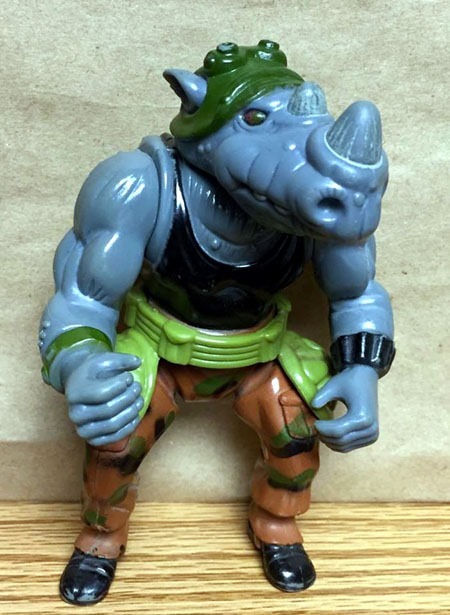 This is a genuine, vintage Rocksteady…though unfortunately, I’ve been unable to locate my original original figure, so this is one I was able to get for a very reasonable price online not too long ago. Then we have the newer version, as seen in the current animated series. I find this one to be a lot more angular and "rough" compared to the softer/"rounder" original. 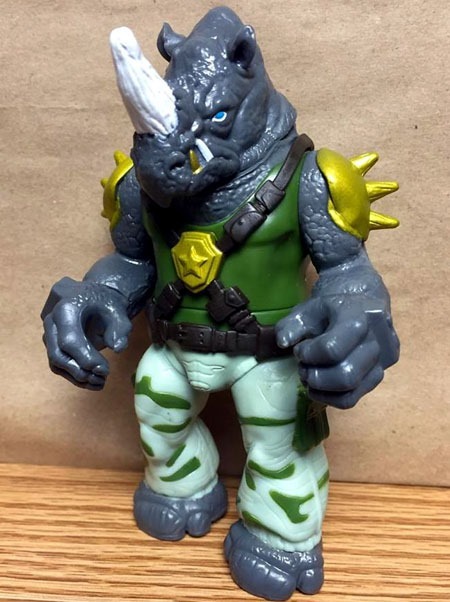 Like Bebop, this version of Rocksteady is Rocksteady in nickname, not the actual character–at least originally, prior to being dubbed "Rocksteady." And here’s the 2016 movie version, TMNT: Out of the Shadows. Like the movie Bebop, this one looks like some sort of biker or such, certainly a bruiser, and not at all like anyone I’d want to meet randomly…anywhere. Perhaps simply for having been a (CGI) character in a live-action movie, this version seems the most "believable" or "realistic" of the three, though each certainly has its place! And here are all three versions side-by-side. 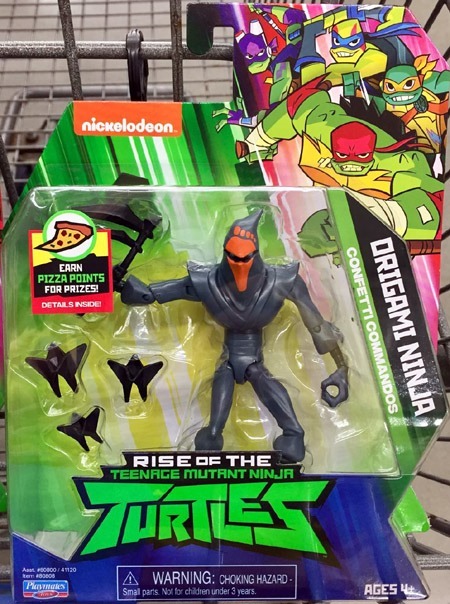 It’s rather interesting to me to consider that I’ve been around long enough, that I’ve been into TMNT long enough that there’ve been three entirely separate toy lines, such that I’ve found all three versions (originally) "on the pegs" at stores. I’m not sure which version of these I’d prefer if I had to choose one…perhaps for nostalgia’s sake, I’d have to go with the original, even though I’m not a huge fan of the character, exactly. Again as with Bebop, I’d much prefer to see a version based on the contemporary IDW comics series,where I feel like the characters have been handled the best of all the iterations.